If anybody can give newly outed “performance artist” Alex Jones tips on how to be the best faux-conservative right-wing blowhard “character” he can be, it’s Stephen Colbert. (He’s got a bit of experience in that realm, you see.) 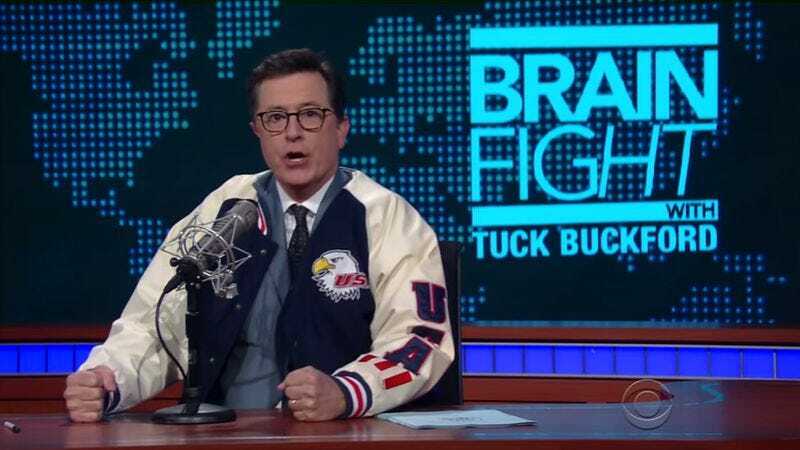 And Colbert graciously demonstrated proper red-faced bellowing technique on last night’s episode of The Late Show With Stephen Colbert, where he debuted a new character, Brain Fight host Tuck Buckford. Like Jones, Buford is intent on proving his masculine bona fides by yelling about the hot red blood pumping through his beefy veins—”My heart is a volcano! It’s time to throw a virgin in there!,” he declares—but unlike Jones, Buford is not a “performance artist.” Why? “Because I hate artists, because Andy Warhol put chemicals in Campbell’s Soup that turns veterans into bisexual zombies!” Obviously. Wake up, sheeple!